Man, that "Gaze into the fist of Dredd!" picture is one of the great panels of comicdom! It ranks up there with Batman's one-punch knockout of Guy Gardner and Ozymandias' "I did it 35 minutes ago" line in terms of great single panels from the '80s. Every kid who read that for the first time had to stop, pick their jaw up off the floor, and ask, "Oh, crap, did that just happen?" But why exactly is that first of Dredd panel so powerful? Introduced in 1977, Judge Dredd had been spent his first three years fighting mostly forgettable perps. 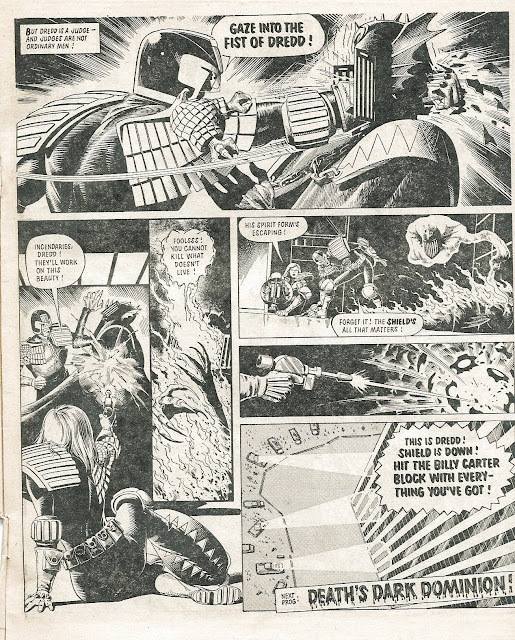 He dispensed justice in his typically cold, ruthless fashion, and the backdrop of Mega City One allowed for some insightful commentary for contemporary British culture. But readers hadn't really seen much in terms of a recurring bad guy. No Mean Machine or even Chopper yet, just a stream of virtually nameless, interchangeable antagonists. Then, in early 1980, John Wagner and Brian Bolland introduced Judge Death. He acted like a dark version of the Judges; he believed that all crimes were committed by the living, so killing everyone would therefore prevent all crime. Naturally, this put him at odds with Dredd. However, the challenge was that Judge Death was a spirit that could travel from host body to host body, making even capture difficult. After a challenging chase, he was only able to be captured by Psi-Judge Anderson willingly letting him take possession of her body, allowing her to hold him in place long enough to be completely encased in a gelantinous-like substance called Boing, which seemed to keep the spirit imprisoned as well. Anderson's body, still encased in Boing, was laid to rest for sacrificing herself in line the of duty. A year later, Judge Death was released by his companions: Judges Fear, Mortis, and Fire. The four of them then start a killing spree, murdering literally every person they come in contact with. The Judges are once again called on, and they soon find that Boing is very combustible, thus allowing Judge Fire to render it unusable. Every weapon they have is effectively useless, while the Dark Judges continue their rampage. 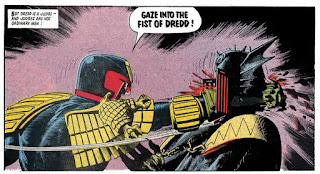 Eventually Judges Dredd and Andreson confront Judge Fear, who has been killing his victims by opening his mask and forcing them to gaze into fear itself. The sheer terror kills them almost instantly. Judge Fear captures Anderson in a mantrap (basically one of those jaw-clamp-looking bear traps) and assaults Dredd directly, grasping his head and forcing him to "gaze into the face of Fear!" 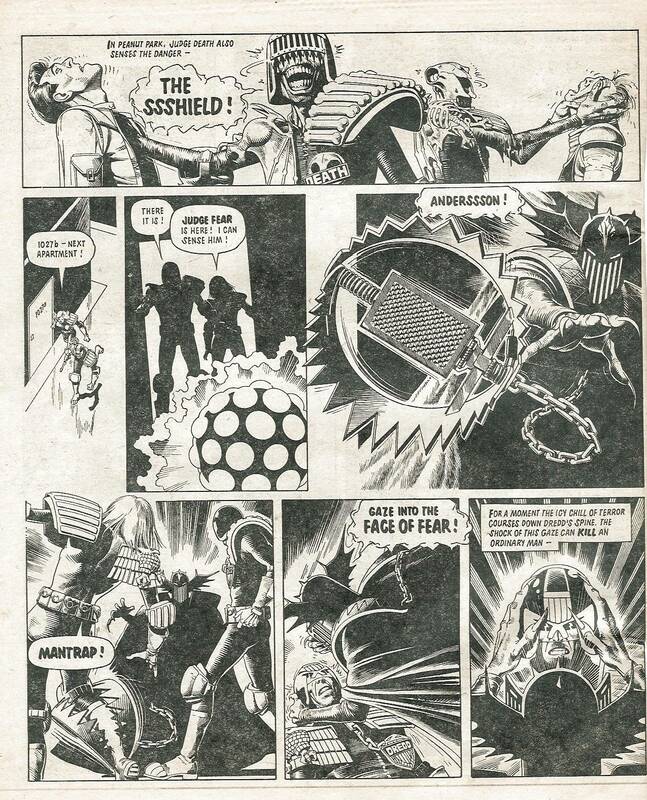 Readers then come to the end of the page with a lingering caption that reads, "For a moment the icy chill of terror courses down Dredd's spine. The shock of this gaze can kill an ordinary man--"
Which is when, of course, Dredd hauls off and smashes Judge Fear in the face so hard that his fist breaks through the back side of Fear's helmet! It's not just defiance against the Dark Judges, it's not even the defiance of the very concept of death, it's outright anger that anyone might try to take his life. Dredd is known for being stoic and unrelentingly cool in all situations. He's fought entire city blocks of people single-handed without so much as a second thought, and never took direct affronts against him personally. These Dark Judges, though, pissed him off. He knows full well that his fist isn't going to really harm these villains who've already withstood much deadlier firepower without flinching. This is Dredd unleashing his anger and frustration. You can't fight death when it's staring you in the face, and you certainly can't punch your way out of that. But damn if Dredd isn't going to try. And that is why the "Gaze into the fist of Dredd!" panel is so powerful, despite a rather static and flat angle. It's not the punch itself that was so compelling, but everything that led up to it.